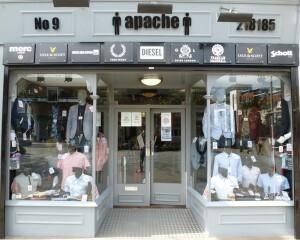 Don’t worry any longer, its time for another Apacheonline Discount Code for all our loyal customers and followers. After our last Twitter discount code promotion, we had a fantastic reaction and saved you all a few pounds too. We think that this offer will be our most popular yet, as who doesn’t like something for nothing? To receive your 10% apacheonline discount code, simply subscribe to our blog and comment on this post and you will be emailed a personalised unique code. So once we receive notification of your subscription to our blog and your comment, we will then email you a fantastic 10% Apacheonline Discount Code, as simple as that. So don’t delay, get over to Apacheonline, pick yourself out a fresh new outfit and subscribe to our blog for a 10% Discount Code. We are far too kind to you all! Don't worry any longer, its time for another Apacheonline Discount Code for all our loyal customers and followers. After our last Twitter discount code promotion, we had a fantastic reaction and saved you all a few pounds too. We think that this offer will be our most popular yet, as who doesn't like something for nothing? Apacheonline Discount Code for Autumn Winter 2013 Apacheonline Discount Code in Store We are offering all our loyal customers a chance to receive a fantastic 10% Apacheonline Discount code to be used on all new season styles. (Not to be used in conjunction with any other offer, sale, voucher or promotion) So why not treat yourself to a nice new Fred Perry M1200 Tipping Polo Shirt, Classic Lyle and Scott Gingham Check Shirt or a pair of brilliant Diesel Darron Tapered Coloured Denim Jeans and get yourself a 10% discount code by doing the following: To receive your 10% apacheonline discount code, simply subscribe to our blog and comment on this post and you will be emailed a personalised unique code. So once we receive notification of your subscription to our blog and your comment, we will then email you a fantastic 10% Apacheonline Discount Code, as simple as that. So don't delay, get over to Apacheonline, pick yourself out a fresh new outfit and subscribe to our blog for a 10% Discount Code. We are far too kind to you all! Thanks Connor, your code will be on its way in the next five minutes!! Enjoy! Hi Peter, thanks for your kind words!! Your code will be with you in five minutes!! Hi Ben, Thanks for your subscription and comment on our blog. Your code will be with you in 5 minutes!! Cheers! Hi and thanks. I have not received it yet though so I typed my email in again. Hi Ben, i sent it earlier and have sent it again. Maybe check your junk or spam folder, if not please get back to us! Hi Guys, great shop, can you send a code please, cheers. Hi Marcus, thanks for subscribing and commenting. Your code will arrive in the next five minutes, please check your junk folder if you dont receive. Cheers! Good morning people – Great site and store, please send code. Hi Paul, thanks for subscribing and commenting. Your code will arrive in the next five minutes, please check your junk folder if you dont receive. Cheers! would you be kind enough to send me a code please? Hi Lawrence, thanks for subscribing and commenting on our blog. Your 10% discount code will be on its way in 5 minutes. Make sure to check your spam folder if you dont receive straight away. Thanks mate! I have a £60 order in the basket, 1p short of the free postage threshold. Please send me the voucher instead! Hi Kim, Thanks for your comment. You will receive your 10% discount code in the next five minutes! Please check your spam folder if it doesnt arrive in that time. Thanks once again! Hi Jay, Thanks for your comment on our blog. Check your inbox in around five minutes, might be a little something in there for you!! If not check your spam folder. Cheers! Hi Jayne, thanks for your kind words. Please check your inbox (or spam folder) in the morning and there maybe a little something for you there! Thanks again and look forward to receiving an order from you soon. Hi Clare, thanks for your comment on our blog. Please check your inbox (or spam folder) in the morning, you never know what you might find!! We look forward to receiving an order from you soon! sorry for the delay but i have now sent your discount code. Excellent service – Stuart was great – and such good prices. Lyle and Scott has never been such a tease! Any chance of a voucher…..? That will make my day! Hi Jonathan and thank you for your very kind words!! Check your inbox (or spam folder) in a while and there might be a little surprise! Hi Halo, thank you very much for your comment, please check your inbox (or spam folder) in a little while, who knows what you might find! That’s Fab! Just ordered a lovely polo shirt for my son and got £7 off. Thanks so much! Thank you Halo for your order, im sure your son will LOVE it!! See now I’ve found you I cant leave you alone!! can I have a discount code pleeeeease? Pretty please? Hi Laura, thanks for your kind words!! Check your inbox (or spam folder) in a few minutes, and there maybe a little surprise for you! Hi Iain, thanks for your comment on our blog and thanks for your order! Check your inbox (or spam folder) in a few minutes and there may be a little surprise to use on your next order! Cheers! Hi Zac, Thanks for your comment on our blog! Please check your inbox (or spam folder) in a while and you never know what you might find!! Morning Caroline! Thank you so much for your comment on our blog. Please check your inbox (or spam folder) in a few minutes and there may be a little surprise for you! Hi Emms, Thank you for your comment on our blog. Please check your inbox (or spam folder) in the next few minutes and you may find a little surprise! Please can we have a discount code – Thank you! Hi Stacy, sorry for the late reply, its been manic in the shop today!! Please check your inbox (or spam folder) in the next few minutes and there could be a little Xmas treat for you! Thanks for your comment on our blog, please check your inbox (or spam folder) in the next few minutes and you never know what you might find! Can I get a code please?? Hi Anuj, thank you very much for your comment. Please check your inbox (or spam folder) in the next few minutes and there may be a little something for you! Would love a code if possible! Thanks. Hi Tom, thank you for your comment on our blog. Sorry we have only just come back to work today. Thank you for your order and as a thank you for that, please check your inbox (or spam folder) in the next few minutes and there may be a little something for your next order. Thanks mate! Great site, send code so that I can order! Hi Mal, thank you so much for your comment. We have only just came back to work today and have only just seen your your order too, thank you very much! As a thank you for this, please check your inbox (or spam folder) in the next few minutes and there may be a little something towards your next order! Hi katherine, thank you for your comment on our blog. Please check your inbox (or Spam folder) in the next few minutes and there may be a little something for you! Happy New Year!! Hi Toby, thanks for your comment on our blog post. Please check your inbox (or spam folder) in the next few minutes and there may be a surprise for you! Hi scot thanks for your comment. Please check your inbox (or spam folder) in the next few minutes and there may be something for you!! Hi, great site guys, can I get a code? Hi Mat, thanks for you for your comment on our blog. Please check your inbox (or spam folder) in the next few minutes and there may be a little surprise for you!